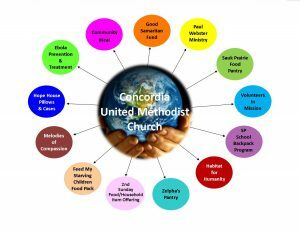 Serving a meal twice a month is one way we strive to reach and serve the community we live in. 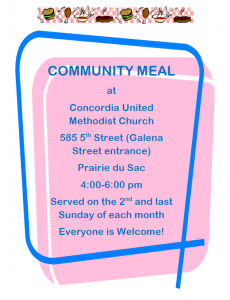 We offer a free meal on the second and last Sunday of each month, serving from 4 – 6 p.m. in our Fellowship Hall. For more information or to get involved, contact Dennis Roelke at roelked@charter.net. Temba Nkomozepi is a missionary with the United Methodist Board of Global Ministries serving as an agriculturalist at Mujila Falls Agricultural Center in Zambia. Temba takes part in a range of agricultural, education, and health projects, as well as church growth and development. Concordia will be supporting Temba in 2019! We have pledged to raise $2,500 each year to support Pauls salary. To give, please designate gift to Paul Webster in the Sunday offering.